Kofi Atta Annan (born 8 April 1938) is a Ghanaian diplomat who served as the seventh Secretary-General of the United Nations from 1 January 1997 to 31 December 2006. Annan and the United Nations were the co-recipients of the 2001 Nobel Peace Prize. Kofi Annan was born in the Kofandros section of Kumasi, Ghana – in what was then the British colony of the Gold Coast. He is a twin, a respected status in Ghanaian culture. His twin sister Efua Atta, who died in 1991, shares the middle name 'Atta', which in Fante and Akan means 'twin'. Annan's family was part of the country's elite; both of his grandfathers and his uncle were tribal chiefs. Annan is married to Nane Maria Annan, née Lagergren, a Swedish lawyer and artist who is the half-niece of Raoul Wallenberg. He has two children, Kojo and Ama, from his previous marriage to Titi Alakija, a Nigerian, whom he divorced in the late 1970s. Annan also has one stepchild, Nina Cronstedt de Groot, Nane's daughter from a previous marriage. Annan and his wife with Brad Pitt and Angelina Jolie at the World Economic Forum. In the Ghanaian tradition, some children are named according to the day of the week on which they were born, and/or according to how many of their siblings came before them. Kofi in Akan is the name that corresponds with Friday. The middle name, Atta, indicates that he is a twin. In his earlier years at the UN, Annan's last name had widely been mispronounced as rhyming with "anon"; Annan has let it be known that his name rhymes with "cannon". From 1954 to 1957, Annan attended the elite Mfantsipim school, a Methodist boarding school in Cape Coast founded in the 1870s. Annan has said that the school taught him "that suffering anywhere concerns people everywhere". In 1957, the year Annan graduated from Mfantsipim, Ghana gained independence from Britain. In 1958, Annan began studying for a degree in economics at the Kumasi College of Science and Technology, now the Kwame Nkrumah University of Science and Technology of Ghana. He received a Ford Foundation grant, enabling him to complete his undergraduate studies at Macalester College in St. Paul, Minnesota, United States, in 1961. Annan then did a DEA degree in International Relations at the Graduate Institute of International Studies (Institut universitaire des hautes études internationales IUHEI) in Geneva, Switzerland, from 1961–62, later attending the MIT Sloan School of Management (1971–72) Sloan Fellows program and receiving a Master of Science (M.S.) degree. Annan is fluent in English, French, Kru, other dialects of Akan, and other African languages. In 1962, Kofi Annan started working as a Budget Officer for the World Health Organization, an agency of the United Nations. From 1974 to 1976, he worked as the Director of Tourism in Ghana. Annan then returned to work for the United Nations as an Assistant Secretary-General in three consecutive positions: Human Resources, Management and Security Coordinator, from 1987 to 1990; Program Planning, Budget and Finance, and Controller, from 1990 to 1992; and Peacekeeping Operations, from March 1993 to February 1994. The Rwandan Genocide took place while Annan was in charge of UN Peacekeeping Operations. In his book Shake Hands with the Devil: The Failure of Humanity in Rwanda, Canadian ex-General Roméo Dallaire, who was force commander of the United Nations Assistance Mission for Rwanda, claims that Annan was overly passive in his response to the incipient genocide. General Dallaire explicitly asserts that Annan held back U.N. troops from intervening to settle the conflict, and from providing more logistical and material support. In particular, Dallaire claims that Annan failed to provide any responses to his repeated faxes asking him for access to a weapons depository, something that could have helped defend the endangered Tutsis. Ten years after the genocide, in which an estimated 800,000 people were killed, Annan admitted "I could and should have done more to sound the alarm and rally support." Annan served as Under-Secretary-General until October 1995, when he was made a Special Representative of the Secretary-General to the former Yugoslavia, serving for five months in that capacity before returning to his duties as Under-Secretary-General in April 1996. On 13 December 1996, Annan was recommended by the United Nations Security Council to replace the previous Secretary-General, Dr. Boutros Boutros-Ghali of Egypt, whose second term faced the veto of the United States. He was confirmed four days later by the vote of the General Assembly, and he started his first term as Secretary-General on 1 January 1997. Annan with then President of Russia Vladimir Putin at United Nations Headquarters on 16 November 2001. Mark Malloch Brown succeeded Louise Frechette as Annan's Deputy Secretary-General in April 2004. In April 2001, he issued a five-point "Call to Action" to address the HIV/AIDS pandemic. As Secretary-General, Annan saw this pandemic as a "personal priority" and proposed the establishment of a Global AIDS and Health Fund in an attempt to stimulate the increased spending needed to help developing countries confront the HIV/AIDS crisis. On 10 December 2001, Annan and the United Nations were jointly awarded the Nobel Peace Prize, "for their work for a better organized and more peaceful world". During the build-up to the 2003 invasion of Iraq, Annan called on the United States and the United Kingdom not to invade without the support of the United Nations. In a September 2004 interview on the BBC, Annan was asked about the legal authority for the invasion, and responded, "from our point of view, from the charter point of view it was illegal." Annan supported sending a UN peacekeeping mission to Darfur, Sudan, and worked with the government of Sudan to accept a transfer of power from the African Union peacekeeping mission to a UN one. Annan also worked with several Arab and Muslim countries on women's rights and other topics. Beginning in 1998 Annan convened an annual UN Security Council Retreat with 15 States representatives of the Council at the Rockefeller Brothers Fund (RBF) Conference Center at the Rockefeller family estate at Pocantico, which was sponsored by both the RBF and the UN. He and his wife also attended the Playhouse at the family estate on the occasion of Brooke Astor's 100th birthday celebration. He is a strong supporter and guest of the family's Asia Society in New York. In June 2004, Annan was given a copy of the Office of Internal Oversight Services (OIOS) report on the complaint of sexual harassment, abuse of authority, and retaliation against Ruud Lubbers, UN High Commissioner for Refugees. The report also discussed allegations of sexual harassment and misconduct against Werner Blatter, Director of UNHCR Personnel, by a long-serving staff member. The investigation report found Ruud Lubbers guilty of sexual harassment and no mention was made publicly of the other charge against a senior official or the two subsequent complaints she filed later that year. In the course of the official investigation, Lubbers wrote a letter that some speculate was a threat to the female worker who had brought the charges of misconduct. However, on 15 July 2004, Lubbers was declared innocent by Kofi Annan. His decision only lasted until November when OIOS issued its annual report to the UN General Assembly noting it has found Lubbers guilty. Widely reported in the media, these events served to weaken Annan's position. On 17 November 2004, Annan accepted a report clearing UN Under-Secretary-General for Internal Oversight Services Dileep Nair of political corruption and sexual harassment charges—charges which some viewed as retaliation against Nair for supporting the complainant in the Lubbers affair. However, clearance was not viewed favorably by some UN staff in New York, leading to extensive debate on 19 November. In February 2005, Lubbers resigned as head of the UN refugee agency. In December 2004, reports surfaced that the Secretary-General's son Kojo Annan received payments from the Swiss company Cotecna Inspection SA, which won a lucrative contract under the UN Oil-for-Food Program. Kofi Annan called for an investigation into this matter. The Independent Inquiry Committee into The United Nations Oil-for-Food Program was appointed by Annan and led by former US Federal Reserve Chairman Paul Volcker;, the director of the United Nations Association of the United States of America. In his first interview with the Inquiry Committee, Annan denied having had a meeting with Cotecna. Later in the inquiry he recalled that he had met with Cotecna's chief executive Elie-Georges Massey twice. In a final report issued on 27 October, the committee found insufficient evidence to indict Kofi Annan on any illegal actions, but did find fault with Mr. Benan Sevan, a Cypriot national who had worked for the UN for about 40 years. Appointed to his Oil-For-Food role by Kofi Annan, Mr. Sevan repeatedly asked Iraqis for allocations of oil to the African Middle East Petroleum Company. Sevan's behavior was "ethically improper", Volcker said to reporters. Sevan for his part, has repeatedly denied the charges and argues that he is being made a "scapegoat". The Volcker report was also highly critical of the UN management structure and the Security Council oversight and strongly recommended a new position of Chief Operating Officer to handle the fiscal and administrative responsibilities which currently fall to the Secretary General's office. The report listed the companies, both Western and Middle Eastern, who illegally benefited from the program. Kofi Annan supported his deputy Secretary-General Mark Malloch Brown, who openly criticized certain right-wing segments of the United States media in a speech on 6 June 2006: "[T]he prevailing practice of seeking to use the UN almost by stealth as a diplomatic tool while failing to stand up for it against its domestic critics is simply not sustainable. You will lose the UN one way or another. [...] [That] the US is constructively engaged with the UN [...] is not well known or understood, in part because much of the public discourse that reaches the US heartland has been largely abandoned to its loudest detractors such as Rush Limbaugh and Fox News." The interim U.S. ambassador John R. Bolton was reported to have told Annan on the phone: "I've known you since 1989 and I'm telling you this is the worst mistake by a senior UN official that I have seen in that entire time." At the end of Kofi Annan's tenure as Secretary General, Bolton was asked to sum up Annan's years at the UN. He responded simply: "I'll pass." For his part, Bolton was never confirmed by the U.S. Senate and later worked for Fox. Kofi Annan was the overseeing Secretary-General of the United Nations General Assembly during the successful passing (by consensus) of UN Resolution 61/225 - World Diabetes Day. The Resolution was, and still remains, the second-ever UN General Assembly Resolution on any health-related issue (the other being HIV/AIDS). However, 61/225 remains the only Health-related UN Resolution to ever pass by consensus. The Resolution was sponsored by the Republic of South Africa and Bangladesh, and was passed on 20 December 2006. On 19 September 2006, Annan gave a farewell address to world leaders gathered at the UN headquarters in New York, in anticipation of his retirement on 31 December. In the speech he outlined three major problems of "an unjust world economy, world disorder, and widespread contempt for human rights and the rule of law", which he believes "have not resolved, but sharpened" during his time as Secretary-General. He also pointed to violence in Africa, and the Arab-Israeli conflict as two major issues warranting attention. After years of research, Annan presented a progress report, In Larger Freedom, to the UN General Assembly, on 21 March 2005. Annan recommended Security Council expansion and a host of other UN reforms. On 31 January 2006, Kofi Annan outlined his vision for a comprehensive and extensive reform of the UN in a policy speech to the United Nations Association UK. The speech, delivered at Central Hall, Westminster, also marked the 60th Anniversary of the first meetings of the UN General Assembly and UN Security Council. On 7 March 2006, he presented to the General Assembly his proposals for a fundamental overhaul of the United Nations Secretariat. The reform report is entitled: "Investing in the United Nations, For a Stronger Organization Worldwide". On 30 March 2006, he presented to the General Assembly his analysis and recommendations for updating the entire work programme of the United Nations Secretariat over the last 60 years. The report is entitled: "Mandating and Delivering: Analysis and Recommendations to Facilitate the Review of Mandates". Upon his return to Ghana, Annan was immediately suggested as a candidate to become the country's next President. He has become involved with several organizations with both global and African focuses. 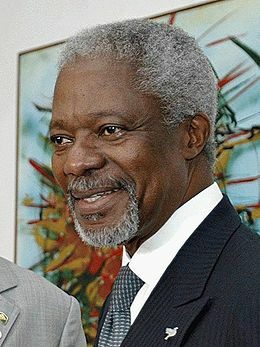 In 2007, Annan was named chairman of the prize committee for the Mo Ibrahim Prize for Achievement in African Leadership, was chosen to lead the new formation of Alliance for a Green Revolution in Africa (AGRA), became a member of the Global Elders, was appointed president of the Global Humanitarian Forum in Geneva, and was selected for the MacArthur Foundation Award for International Justice. In the beginning of 2008, as head of the Panel of Eminent African Personalities, Annan participated in the negotiations to end the civil unrest in Kenya. He threatened to leave the negotiations as mediator if a quick decision was not made. On 26 February 2008 he suspended talks to end Kenya's violent post-election crisis. On 28 February, Annan managed to have President Mwai Kibaki and Raila Odinga sign a coalition government agreement and was widely lauded by many Kenyans for this landmark achievement. That was the best deal achieved then under the mediation efforts. Annan currently serves on the board of directors of the United Nations Foundation, a public charity created in 1998 with entrepreneur and philanthropist Ted Turner's historic $1 billion USD gift to support UN causes. The UN Foundation builds and implements public-private partnerships to address the world's most pressing problems, and broadens support for the UN. Annan is a member of the Africa Progress Panel (APP), an independent authority on Africa launched in April 2007 to focus world leaders' attention on delivering their commitments to the continent. The Panel launched a major report in London on Monday 16 June 2008 entitled Africa's Development: Promises and Prospects. Kofi Annan was appointed the Chancellor of the University of Ghana in 2008. Annan has signed up to be one of the Counsellors at One Young World a non-profit organisation which hopes to bring together 1500 young global leaders of tomorrow from every country in the world. In May 2009 Columbia University announced that Annan will join a new program being launched by Dean John Coatsworth at the School of International and Public Affairs as one of the first group of Global Fellows.The Global Fellows program will bring students together with global practitioners to share firsthand knowledge of experiences in the life of an international or public figure. He is also a fellow of The Committee on Global Thought appointed by the University. On 2 September 2009, Annan was unveiled as the first Li Ka Shing Professor at the Lee Kuan Yew School of Public Policy of the National University of Singapore (NUS). The announcement was made during the school's 5th anniversary celebrations. 2002 winner of the "Profiles in Courage Award", given by the JFK Memorial Museum. Honorary Knighthood from Queen Elizabeth II (GCMG), 2007. ^ Lefevere, Patricia (1998-12-11). "Annan: `Peace is never a perfect achievement' - United Nations Secretary General Kofi Annan". National Catholic Reporter. http://findarticles.com/p/articles/mi_m1141/is_7_35/ai_53460476. Retrieved 2008-02-26. ^ Crossette, Barbara (1997-01-10). "New U.N. Chief Promises Reforms but Says He Won't Cut Jobs". New York Times. http://query.nytimes.com/gst/fullpage.html?res=9B0CE1D81638F933A25752C0A961958260. Retrieved 2008-02-25. ^ "UN chief's Rwanda genocide regret". BBC News. 26 March 2004. http://news.bbc.co.uk/2/hi/africa/3573229.stm. Retrieved 4 April 2010. ^ United Nations (1996-12-13). "BIO/3051 - Kofi Annan of Ghana recommended by Security Council for appointment as Secretary-General of United Nations". Press release. http://www.un.org/News/Press/docs/1996/19961213.bio3051.html. Retrieved 2006-12-12. ^ Traub, James (2006). The Best Intentions. New York: Farrar, Straus and Giroux. pp. 66–67. ISBN 978-0-374-18220-5. http://books.google.com/books?id=chP1YnYFTKYC. ^ United Nations (1996-12-17). "GA/9208 - General Assembly appoints Kofi Annan of Ghana as seventh Secretary-General". Press release. http://www.un.org/News/Press/docs/1996/19961217.ga9208.html. Retrieved 2006-12-12. ^ "Iraq war illegal, says Annan". BBC News (BBC). 2004-09-16. http://news.bbc.co.uk/2/hi/middle_east/3661134.stm. Retrieved 2006-12-12. "When pressed on whether he viewed the invasion of Iraq as illegal, he said: "Yes, if you wish. I have indicated it was not in conformity with the UN charter from our point of view, from the charter point of view, it was illegal."" ^ "Excerpts: Annan interview". BBC News (BBC). 2004-09-16. http://news.bbc.co.uk/2/hi/middle_east/3661640.stm. Retrieved 2006-12-12. ^ "Pocantico Conferences 2005". Rockefeller Brothers Fund website. http://www.rbf.org/grants/programs/pocconference_2005_F.html. Retrieved 2006-12-12. ^ Kuczynski, Alex (2002-04-01). "Grandest Of Dames Turns 100 in Style". New York Times: p. B3. http://query.nytimes.com/gst/fullpage.html?res=9E04E0DD153AF932A35757C0A9649C8B63. Retrieved 2008-03-27. ^ Boxer, Tim (April 2006). "Society's 50th Milestone Honors Rockefellers". 15 Minutes Magazine. http://www.15minutesmagazine.com/archives/Issue_74/front_page.htm. Retrieved 2006-12-12. ^ "UN report slams Lubbers for 'regular sexual harassment'". Expatica. 2005-02-18. http://www.expatica.com/source/site_article.asp?subchannel_id=1&story_id=17094&name=UN+report+slams+Lubbers+over+sexual+harassment. Retrieved 2006-12-12. ^ "About the Committee". Independent Inquiry Committee into The United Nations Oil-for-Food Programme website. http://www.iic-offp.org/about.htm. Retrieved 2006-12-12. ^ "Members". Independent Inquiry Committee into The United Nations Oil-for-Food Programme website. http://www.iic-offp.org/members.htm. Retrieved 2006-12-12. ^ Annan Backs Deputy in Dispute With U.S.
^ Brown, Mark Malloch (2006-06-06). "UN needs US, US needs UN to face challenges -- HIV/AIDS, SUDAN -- that defy national solutions, says Deputy Secretary-General in New York address". United Nations website. United Nations. http://www.un.org/News/Press/docs/2006/dsgsm287.doc.htm. Retrieved 2006-12-12. ^ "Speech by U. N. Leader Draws Angry Response From US". Fox News. 2006-06-07. http://www.foxnews.com/story/0,2933,198535,00.html. Retrieved 2006-12-12. ^ Leopold, Evelyn (2006-09-16). "UN's Annan depicts polarized world in farewell speech". Reuters. http://today.reuters.com/news/articlenews.aspx?type=worldNews&storyID=2006-09-19T173615Z_01_N19388437_RTRUKOC_0_US-UN-ASSEMBLY-ANNAN.xml&archived=False&src=091906_1412_ARTICLE_PROMO_also_on_reuters. Retrieved 2006-12-12. ^ "Annan chides US in final speech". BBC News (BBC). 2006-12-11. http://news.bbc.co.uk/2/hi/americas/6169669.stm. Retrieved 2006-12-11. ^ Annan, Kofi (2006-12-11). "Independence, Missouri, 11 December 2006 - Secretary-General's address at the Truman Presidential Museum and Library followed by Questions and Answers". United Nations website. United Nations. http://www.un.org/apps/sg/sgstats.asp?nid=2357. Retrieved 2006-12-11. ^ "In Larger Freedom". United Nations website. http://www.un.org/largerfreedom/. Retrieved 2006-12-12. ^ "Annan addresses UNA-UK in London". United Nations website. http://www.un.org/apps/news/story.asp?NewsID=17358&Cr=Iran&Cr1=nuclear. Retrieved 2007-08-05. ^ "Reforming the United Nations". United Nations website. http://www.un.org/reform/. Retrieved 2006-12-12. ^ "Reforming the United Nations, Mandate Review". United Nations website. http://www.un.org/mandatereview. Retrieved 2006-12-12. ^ "Annan: Kenya factions 'not capable' of agreement - CNN.com". CNN. 25 February 2008. http://edition.cnn.com/2008/WORLD/africa/02/25/kenya.talks/index.html. Retrieved 4 April 2010. ^ "Kofi Annan appointed Chancellor of University of Ghana". General News of Wednesday, 30 July 2008 (Ghana Home Page). http://www.ghanaweb.com/GhanaHomePage/NewsArchive/artikel.php?ID=147650. Retrieved 2008-08-01. ^ "Honorary knighthood for Kofi Annan". Metro. 2007-10-24. http://www.metro.co.uk/news/article.html?in_article_id=72787&in_page_id=34&in_a_source=. Retrieved 2008-02-25. Annan, Kofi A. "Lessons from the U.N. leader" The Washington Post, Dec 12, 2006. "Kofi and U.N. Ideals" The Wall Street Journal, Dec 14, 2006. This page was last modified on 10 August 2010 at 20:19.